All models are 100% hand built from scratch by skillful and experienced craftsmen. The models are built according to the scale of the original ships through original plans or pictures using the plank-on-frame construction method. The hull is built with strips of wood just like the way to build the real boat. The hull is hollow inside, not a piece of solid wood. Inside the hull, there is epoxy helps to keep the strips to bond close to one another and not split, crack or twist even in variable climatic conditions. Most of the customers are very curious about how the boats are built? Just click this link for photos describe how the boat is built from the beginning to the end. Another most concern of the customers is that can you custom make as our design? YES, we can, just provide us with the drawings and detailed photos showing all the angles of the ship/ boat. In case you do not have the drawings, we can build from the photos with no problem. To preserve our environment, we only use the plantation woods such as acacia, eucalyptus similar to poplar, rubber wood, jack wood to build the models. The outside appearance of wood can be stained like the color of precious woods but you still can see the wood grains. Some classic speed boats, we use imported mahogany to build on the deck like the original boat to increase the value of the model. You can notice that many models are painted like the color of the original boat/ ship but the construction of the hull is all made from wood, there are no plastic or resin molding. TALL SHIPS/ HISTORIC SHIPS: Canons, ornaments, figurehead are made from metal, the sails are made from linen. SPEED BOATS: Fittings, trimmings, steering wheels, switches, gauges, gear, rudder, and propellers are made from brass chromed as stainless steel (click this link for photos). Plush seats are hand-stitched from imitation leather with large varieties of colors for your choice (click this link for photos). The windows are made from clear plexiglass. It takes hundreds of man-hours to build one tall ship model such as HMS Victory, USS Constitution, Wasa, Sovereign of the Seas, Friesland, Soleil Royal, San Felipe, etc. The speed boats look more simple as there are no mast or rigging lines, however, there are 9 - 12 coats in total to finish one boat by wet and dry sanding. The final step is hand polish by rubbing the hull with a piece of wool with wax. Once the speed boat is high gloss polished, it just looks like the mirror. Q. Can you custom make my model? Q. Why there are no prices shown on our webpages? A: We supply mostly to dealers, wholesalers, and retailers too. This is why we do not mention our prices on our webpages. However, no worry even if you are an individual buyer, please feel free to contact us for any further question so we can refer you to our nearest dealers. In the otherhand, we do take a commission to build any new model direct from an individual. We quote FOB or C&F from Ho Chi Minh City, Vietnam if you place an order for full container load from our factory, or FOB Houston, Texas, if you place an order in small quantity. We do offer dropship within the USA. At the meantime, we are sorry that we do not offer dropship for international yet. We accept orders through the internet, email or you can contact us by phone, fax. Depend on your order. Once you send us the order list, we will confirm the delivery time upon receipt. 10. How are the ships packed? Each ship is individually packed in a carton box with solid styrofoam, or a wooden frame is used to protect the ship from breakage when the box is accidentally tipped up side down, dropped or even has heavy objects placed on it. 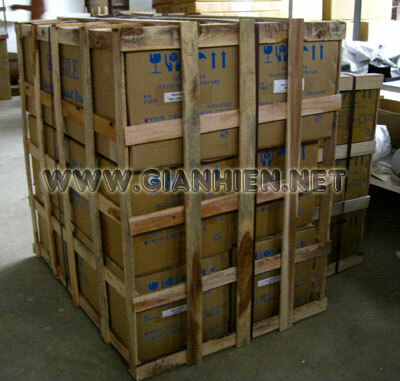 For less than container load shipment, the wooden frame is packed outside the cartons for maximum protection as below photo. 11. How are the models shipped? For USA, we ship by Fedex, UPS ground or by USPS within USA. For international, the models can be shipped by air or sea freight. For large order, we suggest that you use sea freight due to the expense of air-freight costs. However, we can ship your model by air if you desire fast delivery. We have the display cases available which you can see at our display cases page to preserve the model from dust. These boats are as a part of world history, we suggest to put the model in the display case to have the model more valuable. Any special request for a custom make display case is welcome. For USA, we accept most credit cards and PayPal. For international customers, when you place full container order direct from our factory, payment will be made by bank-transfer. You will be provided our bank name, bank account number, swift code when placing an order. Terms: 30% deposit when placing the order. 70% against to the copy bill of lading. For a small amount of order which cost less than US$2,000, we request one-time payment prior to shipment to save the transfer fees for our customer. For air shipment, we request for payment prior to shipment of goods. We do accept L/C at sight. Due to the complexity procedures for the L/C, we only accept for large orders. Q. What can I do if I receive a different model or my model is broken when I unpack? A. Please notify us by fax or email immediately within 7 days of shipment arrival. Please provide us with photos of any damage. Q. Can I have the hard printed catalog mail to my address? A. Yes, we do have a hard printed catalog available and it is free to mail in the USA. For international customers, we request a payment of $45 by PayPal or Western Union for the courier fee to send to your address. Please click here to write us your request. However, we always develop many new models in every month, so that visiting our website frequently is the best way to check all of our updated products.